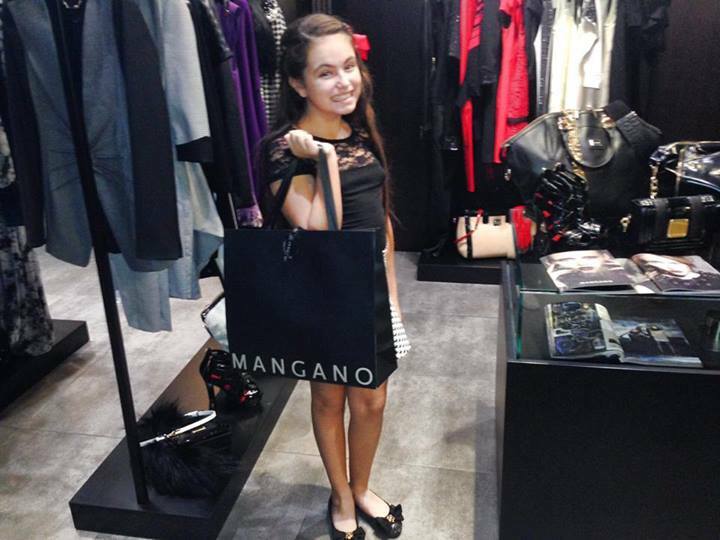 Gaia Cauchi was born on 19th of November 2002. She comes from the small rural village of Mgarr, Malta. She has started her singing career at the age of two and a half. Currently, she is a student of La Voix Academy under the guidance of Gillian Attard and has participated in a number of international and national contests. Gaia has also taken part in the national Italian television talent show called Italian Talent Lab where she was crowned the overall winner. She has also achieved an outstanding success in the Italian television show called Ti Lascia Una Canzone, appearing on it several times starting 2011 ("Proud Mary"). During her adventure on the TV show, Gaia sang with famous Italian singers including Alex Britti, Alessandra Amoroso, Little Tony and world renowned Maltese tenor Joseph Calleja. In 2012, in the age of 9, Cauchi also participated in her age group at the Sanremo Song Festival in Italy where she won first place singing "One Night Only". 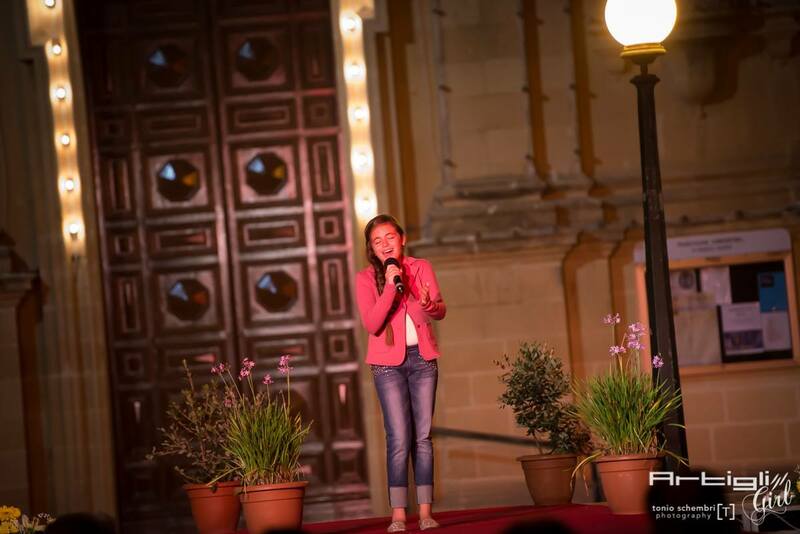 She proceeded to another success in Italy winning talent show Una Stella Sta Nascendo 7. Her song Noti u Kliem was adapted to the Italian language and recorded in Rome. 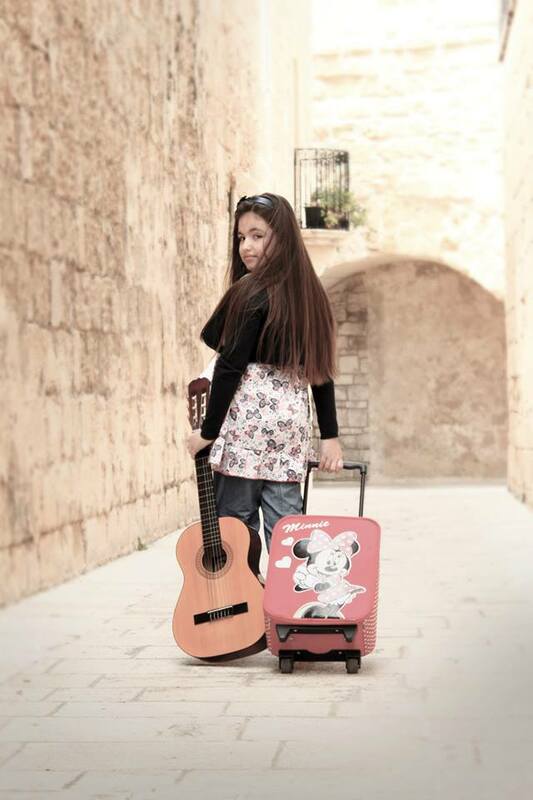 Back in Malta in August 2012 she has won 1st edition of Ghanja Gmiel Is-Seba Noti with "Noti u kliem". 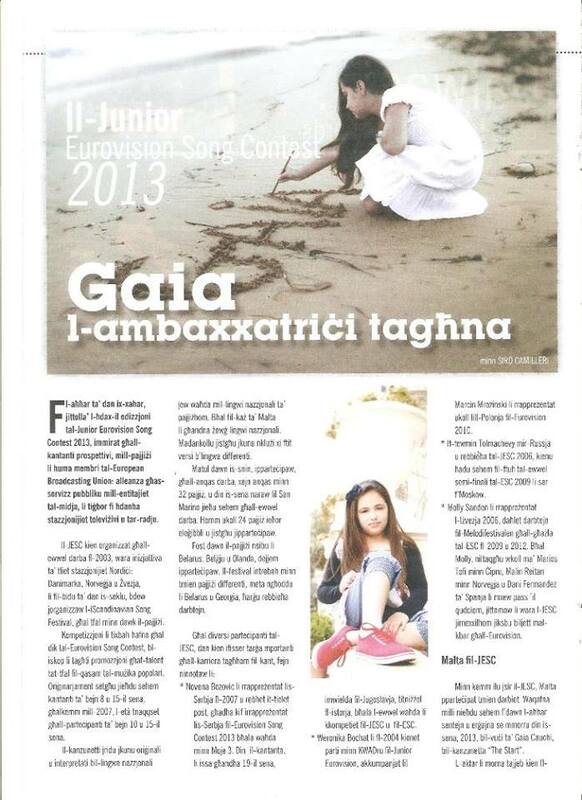 Gaia also has been guest singer at various Maltese shows and has also recorded her own version of Eurovision winning entry "Euphoria". 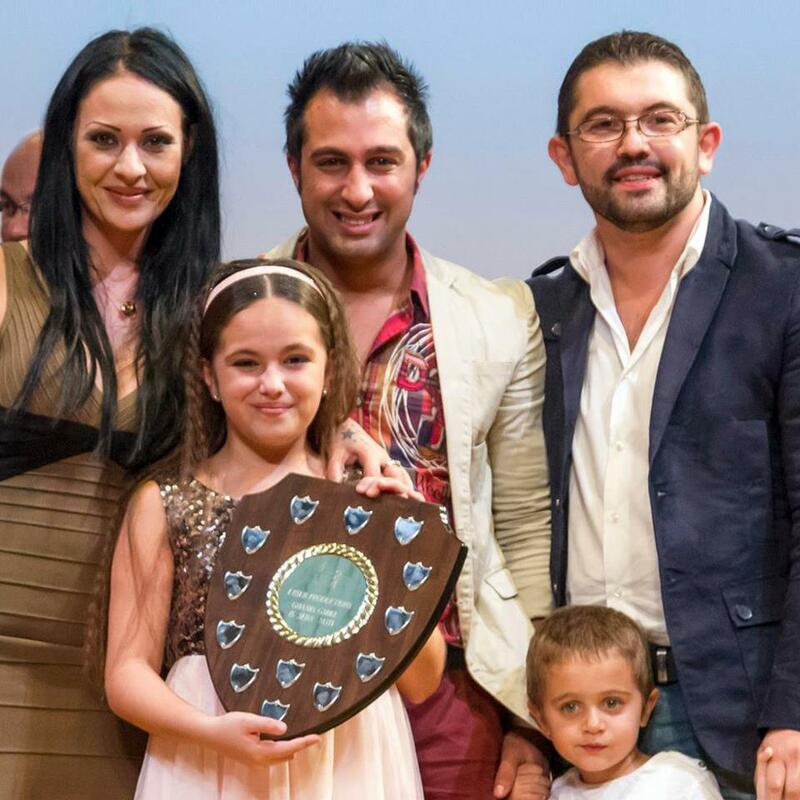 Cauchi became the winner of the International Achievement Award at the Malta Music Awards 2013 and due to this achievement was internally picked to represent Malta at Junior Eurovision. Find more videos of Gaia Cauchi on Youtube and read more on her Facebook. Gaia Cauchi has co-written her entry "The Start" together with her vocal coach Gillian Attard (La Voix Academy) composer Elton Zarb and songwriter Matthew Mercieca "Muxu" (who composed song "Betrayed" by Davinia at the adult ESC 2013 preselection). 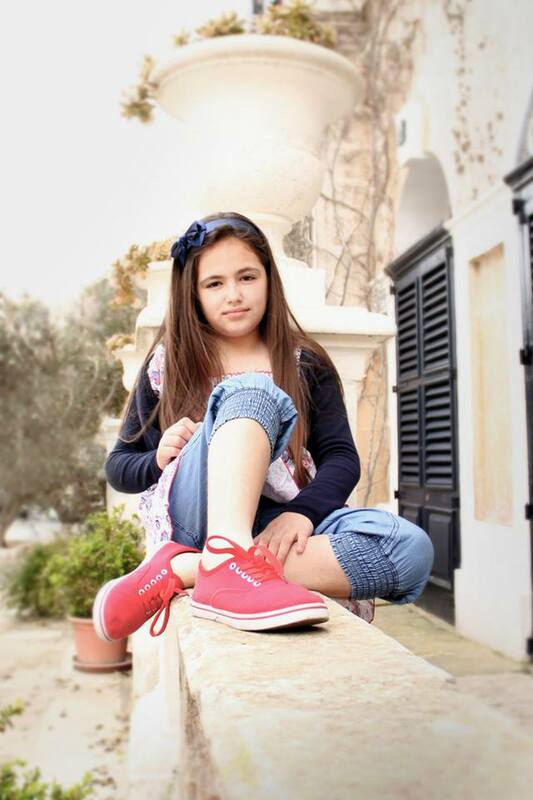 Singer Maxine Pace, participant of preselections for JESC 2009 and 2010, vocally coached by Gillian Attard and Joshua Alamu, has been named as Maltese spokesperson at Junior Eurovision 2013. ���� ����� �������� 19�� ������ 2002 ����. �������� ��� � ��������� ��������� ����� �� ������. ���� ������ ���� ��������� ������� � �������� 2� � ��������� ���. � ��������� ����� ��� �������� �������� �������� La Voix, ����� �������� �������� ������, � ��������� ������� � ���� ������������� � ������� ���������. ���� ����� ��������� ������� � ��� �������� ������������ ����������� ��� ��������� Italian Talent Lab, ��� ����� ���������������. ��� ����� �������� �������� ������ �� ����������� ������� Ti Lascia Una Canzone, � ������� ��������� ������� ��������� ���, ������� � 2011 ���� ("Proud Mary"). �� ��� ��� ��������� � ������ ���������� ������������ �������������, ��� ����� ������, ���������� �������, Little Tony, � �������� ��������� ����������� ������� �������� �������. � 2012 ���� � �������� 9 ��� ����� ������� ������� � ����� ���������� ������ �� ��������� ��� ���� � ������, �������� ������ ����� � ������ "One Night Only". ��� �������� � ��� ������ ������ � ���� ������, ������� ������ �� ��� �������� Una Stella Sta Nascendo 7. �� ����� Noti u Kliem ���� ���������� �� ����������� ���� � �������� � ����. � ������ � ������� 2012 ���� ��� ����� ��������������� �������� Ghanja Gmiel Is-Seba Noti � ������ "Noti u kliem". ���� ����� ��������� ������� � ������ ������ ������������ ������������ ����������� � �������� ���� ������ �����-�������������� ����������� "Euphoria". ����� ����� ��������������� International Achievement Award (������ �� ������������� ����������) �� ��������� ����������� ����������� ������ 2013, � ��������� ����� ���������� ���� ������� ���������� ������� ��� ������� � �������� ������� ����������� 2013. ������ ����� ����������� ���� ����� �� ������ ����� �� Youtube, � ��������� � ��� ������ �� Facebook. ���� ����� �������� ���� ���������� ����� "The Start" ������ �� ����� ��������� �� ������ �������� ������ (La Voix Academy), ������������ ������� ������ � ������ ������ �������� "Muxu" (������� �������� ����� ����� "Betrayed", ����������� �������� �� ������ � ��������� ����������� 2013). ������ ������ ���, ��������� ������� 2009 � 2010, ������������ � ���������� �������� ������ � ������ �����, ���� ������� ��������� ������ �� ������� ����������� 2013.
and now, all is right. and I, won't be afraid. No I, won't look down. � ������ ��� � �������. 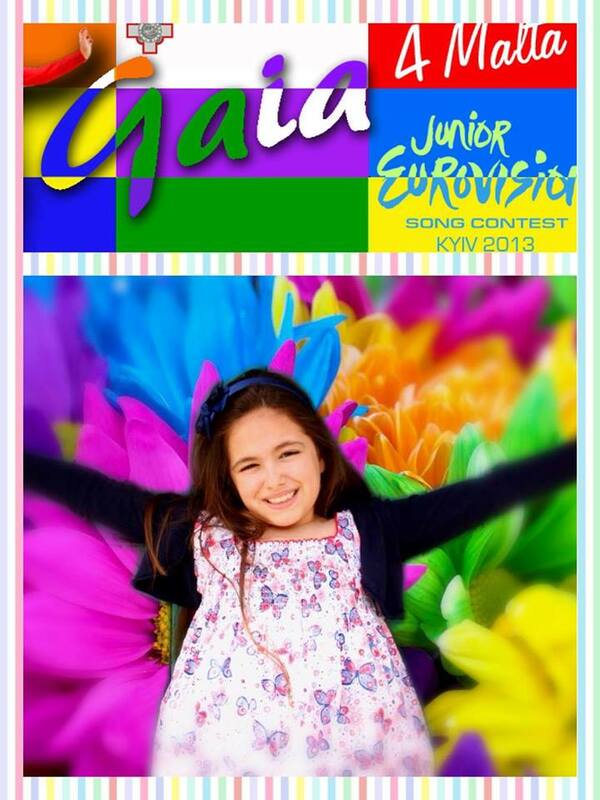 - Hello, Gaia, and first of all congratulations with the fact that you have been selected to represent Malta at Junior Eurovision contest 2013. How have you learnt about that news? - I heard about the news from my vocal teacher Gillian Attard. I was thrilled to learn that I was internally selected by our national television. - Can you tell us about your song The Start, what is the message of it? - My song is a very nice ballad that describes the passion I have for music. It is a very special and emotional song for me. It speaks about the voice inside me. I want to share it with the world; I want to sing to the world, because music is my love. - How was it created, and who has helped you with that? - I came up with the story and the melody. Song writer Muxu and composer Elton Zarb along with my vocal coach Gillian Attard helped me put the song together. - Do you already know whether there will be some instrumentalists/dancers in your stage act in Kyiv? - The song is a ballad and I shall perform the whole act by myself. - What is the most difficult thing for you in stage presentation of your song? - I feel very confident on stage and the song fits my voice perfectly well. I strongly believe I shall give a good performance that will make Malta proud. - What is your plan of preparations for the contest? How often do you rehearse? - Since my song is a ballad, it does not require a large team effort. Therefore I only practice with my vocal coach a few hours every week. 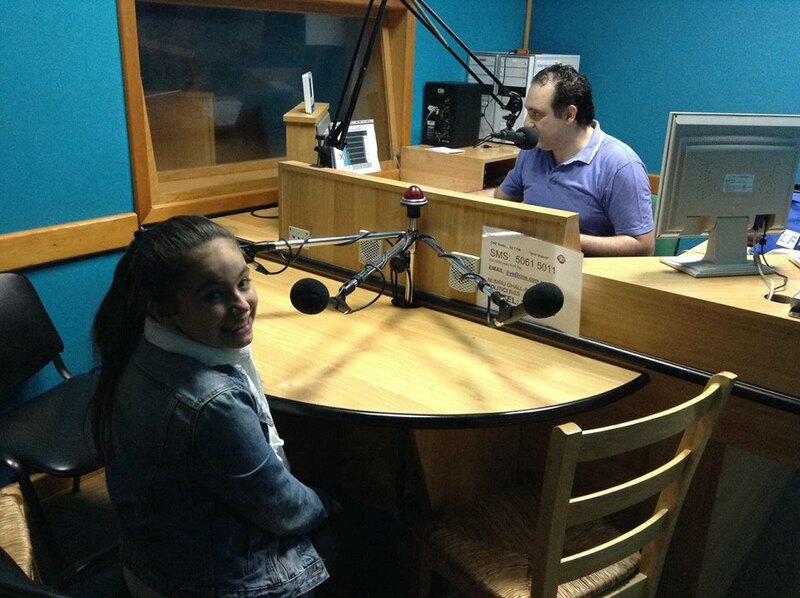 - Have you met any of previous Maltese Junior Eurovision entrants? Any advices received from them? - Not yet, but I shall soon meet with Nicole Azzopardi, the last Maltese contestant. We plan to spend an afternoon together. I am sure she will be able to give me a good advice. - Yes I listen to other contestants all the time. I like to know about the other singers and their songs. This way I can learn about my new friends before meeting them in person in Kiev. 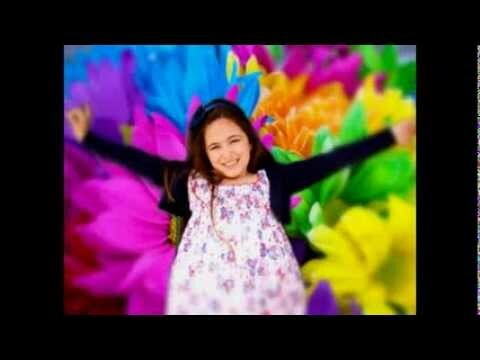 - Malta has been missing from Junior Eurovision for several years, but had you chance to watch Junior Eurovision before; do you have some favourite entries from the competition? - Certainly a song to remember is Bzzz of Bizikebi from Georgia (2008). Last year�s winner Anastasiya Petryk�s song Nebo is still fresh on my mind. - The most important factor about the festival is that Malta is back in the contest. I would like to have fun and enjoy this fantastic experience. However it is my utter responsibility to make my country proud and to secure a good placing. Like every other contestant I hope to win! That would be a mega dream come true! - My day is practically quite full. I go to school on a regular basis. When I get home after school I study and do my homework. Afterwards, my favourite hobby is to listen to music and sing along. Music makes me feel good and happy. - No not at all. I finish school early in the afternoon. Therefore I have the rest of the afternoon and the evening free. I like to spend my free time talking to my parents, singing and practicing with my vocal coach. - I love school. I feel good at school. I am always surrounded by lovely friends. My favourite subject at school is English language. - You have great experience of music contests, what was the most memorable from them? - The music contests that gave me most exposure are certainly the Italian TV show Ti Lascio Una Canzone in 2010, and the prestigious Sanremo Junior in 2012 where I placed first and won the international section. - What your repertoire is made of, are there many original songs? - I have several cover versions but I also have five original songs in Maltese, one of which is Noti u Kliem which was recently translated to the Italian language. - Are you working on the other new songs to be released soon? - At this time I am concentrating on my Junior Eurovision song The Start. However I have already been approached by several local and foreign composers. I am sure that in time I shall release more material. - The Junior Eurovision will serve as a platform to showcase the culture of my country, get to know the other contestants, make new friends and of course have fun. I expect the week to be so busy that time will fly! It will give me the opportunity to share my music all over Europe. 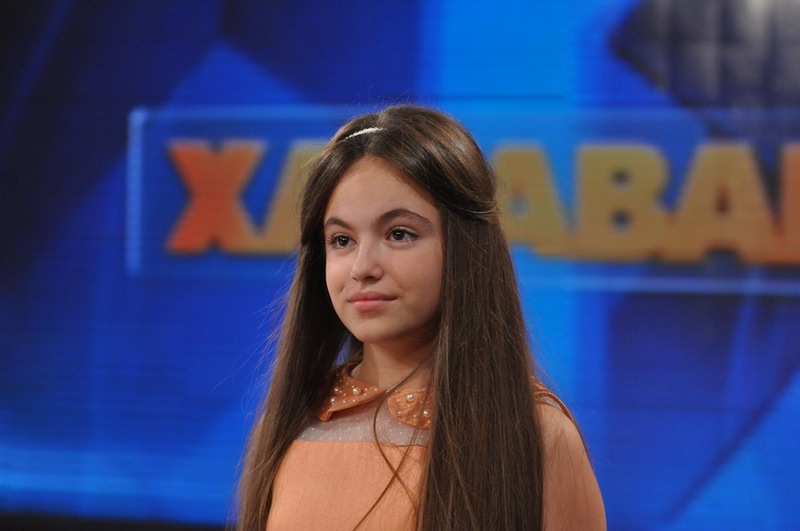 After JESC I will continue to study. My dream is to become a professional singer. I am still young and I am hopeful that one day this dream will come true. - Thanks for the interview, good luck with your preparations and see you soon in Kyiv! - ������, ����, � ������ ����� ���� ������������ � ���, ��� �� ����� ������������������ ������ �� ������� ����������� 2013. ��� �� ������ �� ���� �������? - ��� ���������� ��� ������� �� ������ �������� ������. � ���� ����� ���������� ������, ��� ���� ������������ ����������� ������� ������ ���� �� ����� ���������� ������. - ������ �� �� ���������� ��� � ����� ����� The Start, ����� �� �����? - ��� ����� - ��� ����� �������� �������, ��� ��������� �������, ������� � ��������� � ������. ��� ����� ��������� � ������������� ����� ��� ����. ��� ������� � ��� ������, ������� ����� ������ ����. � ���� ���������� �� �� ���� �����; � ���� ���� ��� ����, ������ ��� ������ - ��� ��� ������. - ��� ��� ���� ������� � ��� ������� ���� � ����? - � ���� ��������� ������� � �������. ���� ����� � ���������� ����� ���� ������ � ���� ��������� �������� ������ ������� ��� ������� ����� �������. - �� ��� ������, ��� ����� � ����� �� ����� � �����, ����� �� �������, ����������������? - ��� ����� - �������, � ������ � ����� ��������� �� �� ����� ����. - ��� �������� ������ ��� ���� � ����������� ����������� ����� �����? - � �������� ���� ������ �������� �� �����, � ����� ��������� �������� ����� ������. � ����, ��� � ����� ������ ���������, � ��� ������ ������ ���� ���������. - ����� ���� ���� ���������� � ��������? ��� ����� �� �����������? - ��������� ��� ����� - �������, � �� ���������� �� ��������� ������ ������� �������. ������, � ��������� �� ����� ��������� �� ������ ������ ��������� ����� ������ ������. - ����������� �� �� � ������-�� ����������� ��������������� ������ �� ������� �����������? �������� �� �� ��� �����-���� ������? - ���� ���, �� ������ � ��������� � ������ ���������, ������� �������� ��������� �� ������� ���������� ������ �� ��������. �� ����� �������� ���� ������. � �������, ��� ��� ������ ���� ��� ������� �����. - ���������� �� ����, ��� ����� ������������ ������ ������ �� ��������, ������ �� �� ������� �� ���������� �����? - ��, � ��� ����� ������ ����� ������ ����������. ��� �������� �������� � ������ ������������ � �� ������. ��� � ����� ������ � ����� ����� ������� ��� �� ����, ��� � ��������� � ���� ������ � �����. - ������ �� ��������� ������� � ������� ����������� ��������� ���. ���� �� � ���� ����������� ���������� �����-�� ��������, � ���� �� � ���� ���� ��������? - ����� ����� � ����� ����� Bzzz ������ Bzikebi �� ������ (2008). � � ���� ������ ��� ����� ����� ��������� ������ ����, � ������� ��� �������� �� �������� � ������� ����. - ����� ���� �� ������� ����� ����� �� ��������? ����� �� �� �� �������, ��� ������ ������ �������� ����� � ������� ����� ������? - �������� ������ ��� ���� �������� ��, ��� ������ ������������ �� ���� �������. � ���� �������� ������������ �� ����� ��������������� �����������. �� � �� �� �����, ���� ������� ���������������� �������� ������� ���, ����� ��� ������ ��������� ����, � ������ ������� �����. ��� � ����� ������ ���������� � ������� �� ������! ��� ���� �� ����-���������� �����! - �������� ���, ��� �������� ���� ������� ����? ��� �� �����������? - ��� ������� ���� ����������� ��������� ��������. ������� ��, � ��������� ���� � �����. ����� � ����������� �����, � ����� �������� ������. ��� ������� ����� - ��� ������� ������ � ��������� ��. ������ ������ ���� ��������� � ����������. - ������ �� ���� ��������� ���������� � �������� � ������ � �����? - ������ ���. � ���������� ����� ����� �����. �������, ���������� ����� ��� � ����� � ���� ��������. � ����� � ��������� ����� �������� �� ������ ����������, ���� � ���������� � ���� ��������� �� ������. - �������� �� ���� �������? ������ ���� ������� ��������? - � ������ �����. � ��� � �������� ���� ������. ���� ������ �������� ��� ������ ������. ��� ������� ������� � ����� - ��� ���������� ����. - � ���� ���� �������� ���� ������� � ����������� ���������, ����� �� ��� ���� ���������� ������ �����? - ������ ����� ��� ������� ������������ ������� Ti Lascio Una Canzone � 2010 ���� � ���������� ��������� Sanremo Junior, �� ������� � ������ � 2012 ���� ������ ����� � ������������� ������. - �� ���� ������� ���� ���������, ����� �� � ��� ������������ �����? - � ���� ���� ��������� ����� ������, �� ����� ���� � ���� ������������ ����� �� ����������� �����, ���� �� �������, Noti u Kliem, ���� ������� ���������� �� �����������. - �� ������ ��������� ��� ������-�� ��� ������ �������? - � ��������� ����� � �������������� �� ����� ���������� ����� The Start. ������, �� ��� ��� ���������� ��������� ������� � ���������� �������. � �������, ��� �� �������� � ��� ������ ����� ������ ���������. - ������ ���� ����� ����� ��������? ���������� �� �� ����� ���������������� �������? - ������� ����������� �������� ���������� �������� �������� ���� ������, ������������� � ������� �����������, ������� ����� ������ � �������� ����� ������������. � ������, ��� ������ ����� ��� ��������� ������� ���������, ��� ����� �������� ������ ���������! ��� ���� ��� ����������� ���������� ���� ������� �� ���� �������. ����� �������� � �������� �������. ��� ����� - ����� ���������������� �������. � ��� ��� ����� ����, � � �������, ��� ������� ��� ������ �������. - ������� ���� �� ��������, ����� � ���������� � �������� � �����! 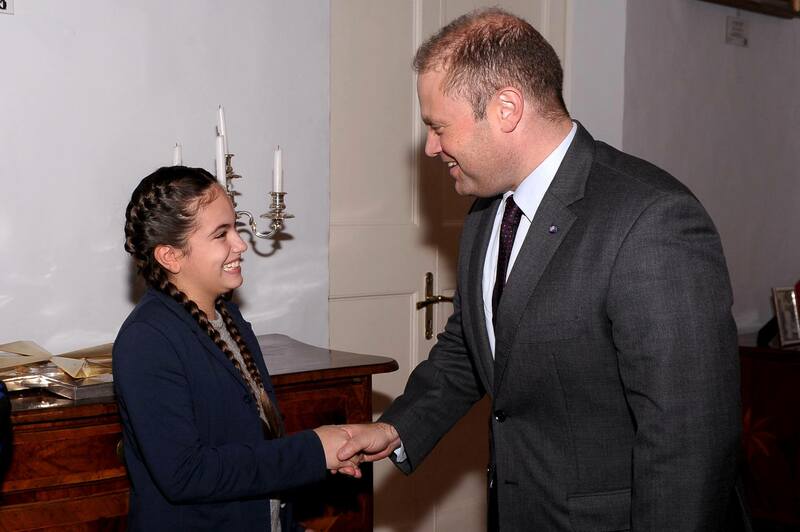 This week Gaia Cauchi, Malta's Junior Eurovision Representative had the honour to meet the Prime Minister of Malta Dr Joseph Muscat at his office in Auberge de Castille, Valletta. 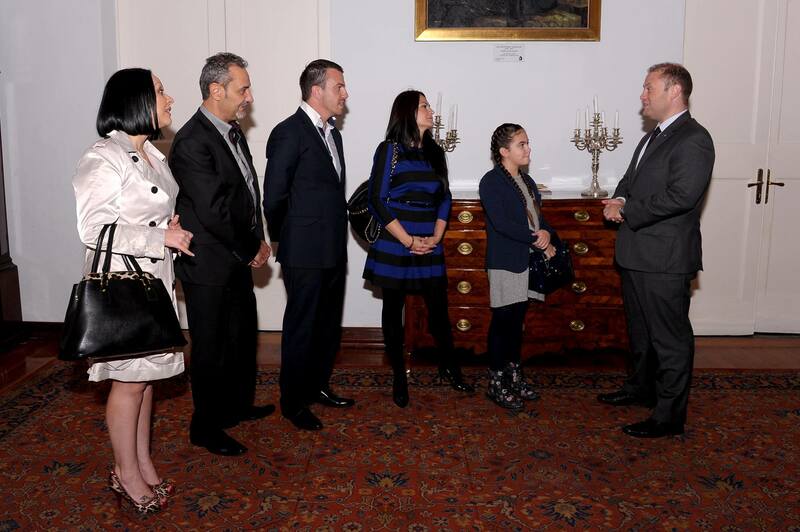 The Prime Minister greeted Gaia and her family. He spent some time discussing this opportunity with Gaia. 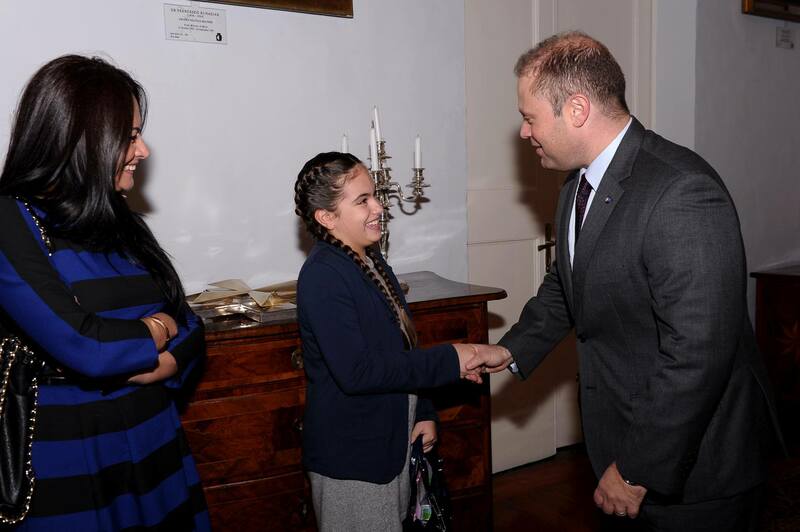 Dr Muscat explained how much he admired her vocal talent. 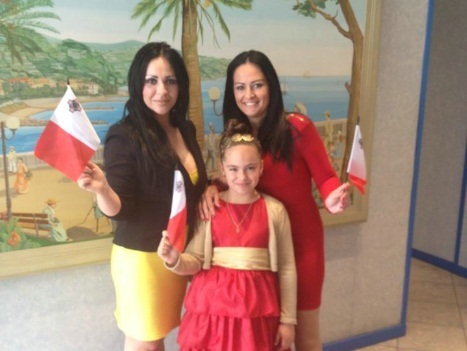 He has also wished her the very best for the contest and promised her that he will be watching her together with his wife Mrs Michelle Muscat and twin daughters, Etoile Ella and Soleil Sophie. 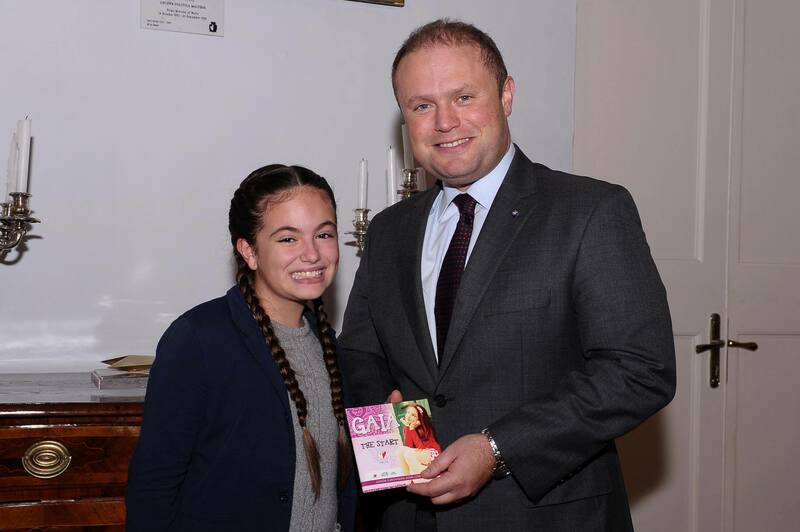 During her visit Gaia presented a copy of the official music CD of the song "The Start" to the Prime Minister. �� ���� ������ ���� �����, ����������������� ������ �� ������� �����������, ����������� � �������-��������� ������ �������� �������� �������� � ��� ����� � �����-��-��������, ��������. �������-������� ����� ��������������� ���� � �� ����� � ������ ��������� ����� �� ����������� � ����� ��������. �� ����������, ��� ������� ������� ���� ������ � ������� �� ����� ���������� �� �������� � ��������, ��� ����� ������� ��� ������ �� ����� ����� ������ ������ � ��������-����������� ������ ����� � ����� ����. �� ����� ������ ���� �������� ����� ������������ ����� � ������ "The Start" �������-��������. 17/10 Maltese entry will be presented tomorrow, on October 18th, in Xarabank music show on TVM broadcaster, reports local website escflashmalta. As we have earlier revealed, the song was composed by songwriters Elton Zarb and Matthew Mercieca "Muxu" (behind "Betrayed" by Davinia at the adult ESC 2013 preselection) together with Gaia Cauchi and her vocal coach Gillian Attard of La Voix Academy. Show will start at 20.45 on TVM1 and will be available to watch online. 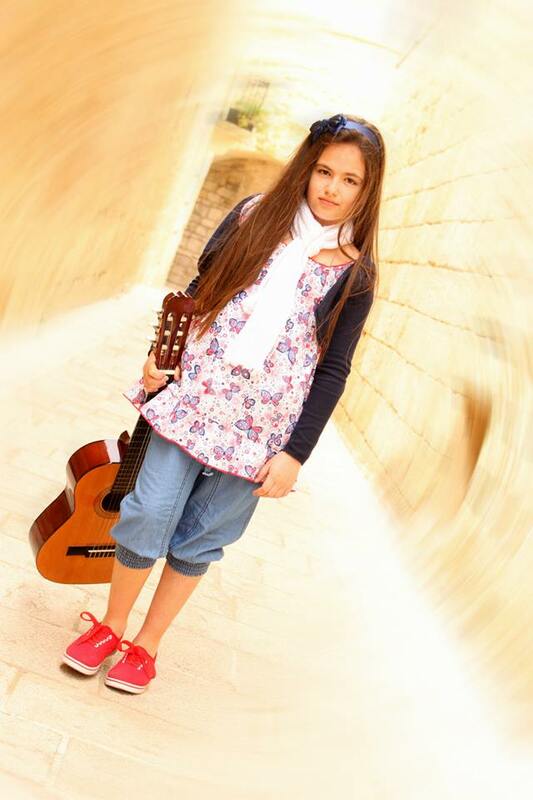 On Saturday, Gaia will be performing at Gozo Fashion Show which will take place in front of St.Francis conventual church starting 20.00 ����� ������ ����� ������������ ������, 18�� �������, � ������ ������������ ��� Xarabank �� ���������� TVM. ��� �� �������� �����, �� �������� ����� ����������� ����� ���� � ������ ������� "Muxu" (������� �������� ����� ����� "Betrayed", ����������� �������� �� ������ � ��������� ����������� 2013), ���� ���� ����� � �� ������� �� ������ �������� ������ �� La Voix Academy. ��������� �������� � 22.45 �� ����������� ������� �� TVM1 � �� ��� ����� ����� ������� ������. � �������, ���� �������� � Gozo Fashion Show, ������� ������� � ������ ��.��������� � 20.00 �� �������� �������. 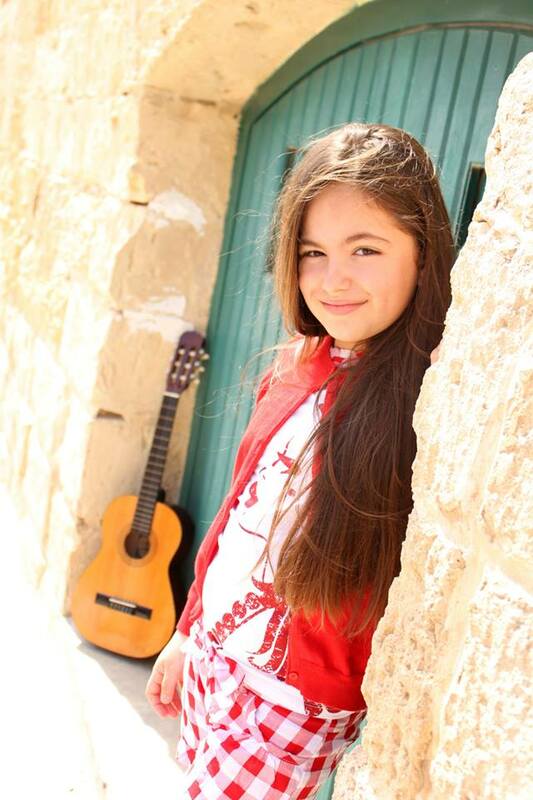 26/09 Public Broadcasting Services of Malta has today during the evening news broadcast confirmed its participation in Junior Eurovision 2013, and announced that Gaia Cauchi, a student of La Voix Academy under the guidance of Gillian Attard, was internally chosen for the competition. 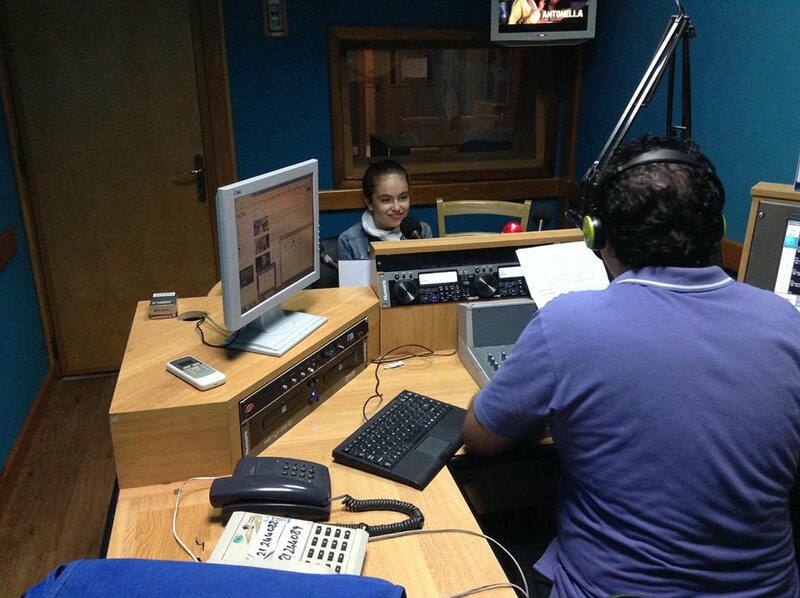 Earlier, she has received International Achievement Award at this years' edition of the Malta Music Awards. 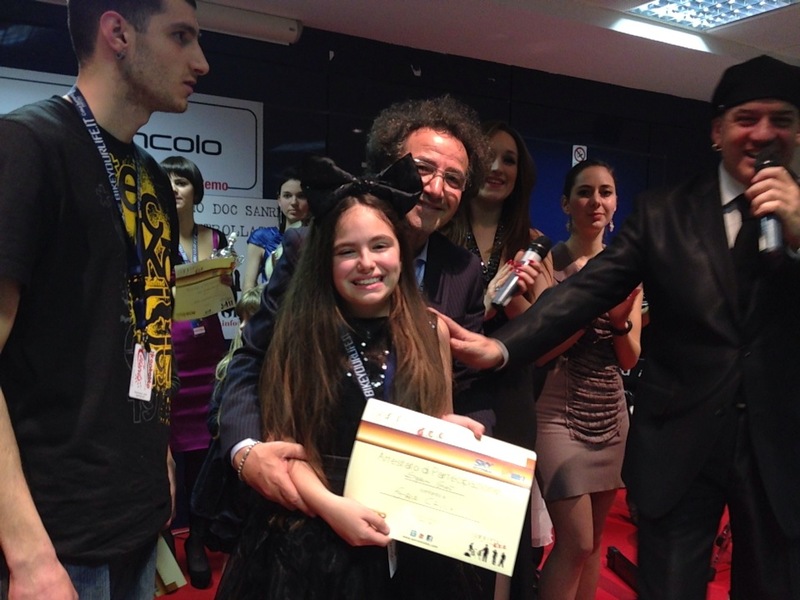 She was also the winner of San Remo Junior competition in Italy, also appearing on RAI program Ti Lascia Una Canzone. PBS CEO Anton Attard explains that PBS ceased to organise the Junior Eurovision Song Contest Festival because of financial motives. 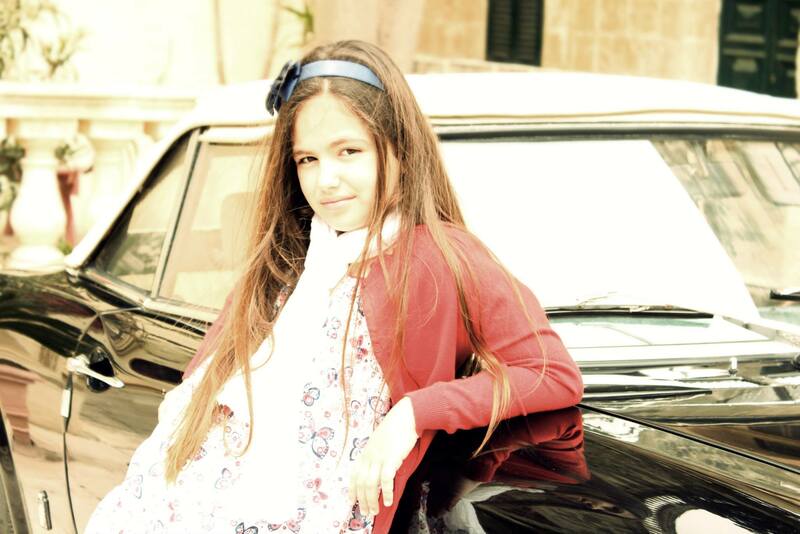 Attard said that PBS decided to take part in the Junior Eurovision Song Contest, after it was approached by a sponsor. In this case, there wasn�t enough time to organise the festival. The preparations of such a festival have to commence 6 months beforehand. If the festival was to be organised in Malta, the total expense would be of Euro 30,000. It is being heavily rumoured that Malta has also applied to host the show in 2014. Speaking yesterday with ESCKAZ, representatives of the delegation were unable to confirm neither 2013 participation, nor 2014 bid. 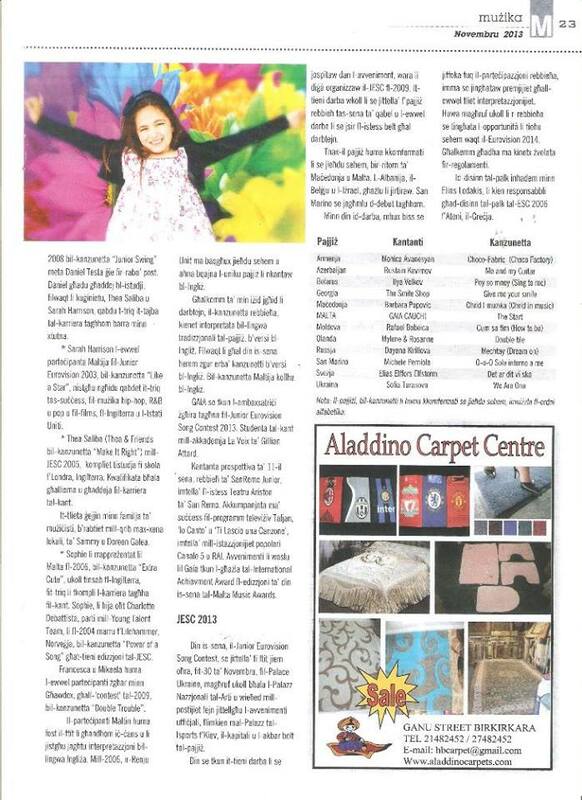 Malta becomes 8th country to confirm participation in Junior Eurovision 2013. With deadline this week, it is expected that full participation list will be announced shortly. According to EBU it will be "eclectic" and there are no doubts that 2013 edition of the show will proceed. ������������ ������������ ������ ������� �� ����� ��������� ������� �������� ����������� ���� ������� � ������� ����������� 2013 � �������� � ���, ��� �� �������������� �� �������� ������ ���� �����, ������� �������� La Voix, ����� �������� �������� ������. �����, ���� �������� ������ �� ������������� ���������� �� ��������� ����������� ����������� ������. ��� ���� ����������� ��������� San Remo Junior � ������, � ������� ������� � ��������� ���������� RAI Ti Lascia Una Canzone. ����� ���������� PBS ����� ������ ���������, ��� ��������� ��������� ���������� ����������� ��������� �� ���������� ��������. ������ �������, ��� ������� �� ������� � ������� ����������� ����� ���� ���� ������� ������ ����� ����, ��� � ������������ ��������� ������������� ������� �������. ������� ��� ����������� ������������� ������ � ������ ������ ��� �� ����������. ���������� � ������ ������ �� ����� ��������. ��������� ����������� ����������� ��������� �� ������ ���������� �������� 30 ����� ����. �������, ��������� ���������� � ���, ��� ������ ����� ���������� �� ���������� � ����� ������ ��� � 2014 ����. ����� �� ������ ESCKAZ ������������� ���� ������ �� ������ �� ����������� ������ ������� � �������� 2013, �� ������ �� ���������� �������� 2014. ������ ���������� 8� �������, ���������� ������������� ���� ������� � ������� ����������� 2013. ��������� ������� ���� ����������� �� ���� ������, ���������, ��� ������ ������ ����������� ����� ����� �������� � ��������� ���. �� ���������� ��� �� ����� "�������������" � � ������������� ��� ������� �������� � ���, ��� ������� 2013 ���� ���������.